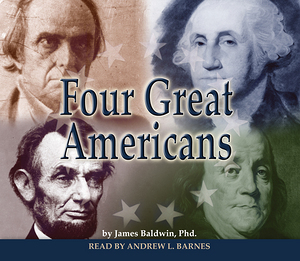 James Baldwin writes about the beginnings of four formidable figures, which were central to the founding of America. He tells the stories of George Washington, Benjamin Franklin, Daniel Webster and Abraham Lincoln. Their lives are set forth in a simple manner, yet with many interesting details, and a glimpse is given of the trials and successes which combined to mold their character and afford such stirring examples for the youth of today. The stories are patriotic in every line, a lesson in every story, and inspire the listener to the best thoughts and deeds. This audio book is intended to summarize the most inspiring events in their lives for young Americans. A great sense of appreciation for the considerable sacrifices of Washington, Franklin, Webster and Lincoln await the listener.